Forest fires on two of Spain's Canary Islands have forced the evacuation of more than 11,000 people, local officials have said. 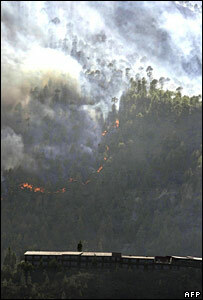 The fires have burnt at least 24,000 hectares (59,000 acres) of land on the islands of Gran Canaria and Tenerife. Spain's Environment Minister Cristina Narbona called a state of "maximum alert" and ordered more water-bombing planes to help douse the fires. Hundreds of firefighters are working with planes to quell the blaze. 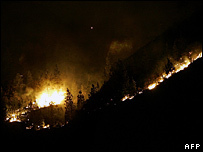 On Saturday, police arrested a forest ranger who admitted to starting one of the fires. The 37-year-old man told police his job contract was about to expire and he wanted to keep working, according to the AP news agency. Previously, dozens of people had been evacuated from seven areas since Friday. Paulino Rivero, head of the regional government said: "The rugged landscape of these islands makes firefighting very complicated, except from the air. "But while there is a lot of wind and very high temperatures, helicopters generally cannot operate." He was quoted by the Associated Press saying: "These are the biggest fires on the archipelago in the last 10 years," he said. A spokesman for Gran Canaria's authorities said fires were burning on four fronts but attention was being focused on two in the central Fataga area. He added that only two helicopters were able to drop water there because of the "terrible" wind. The fire has damaged 65% of the Palmitos bird sanctuary park. There are fears that toucans and other exotic birds may have been killed. A spokeswoman from Tenerife's island authorities said some 300 members of fire and other emergency services were fighting the blazes, with the support of 34 lorries, four helicopters and a water-bomber airplane. Meanwhile, officials in southern Portugal said a major forest fire that broke out on Monday had now been brought under control. Wildfires have also affected Greece this summer amid a heat wave which has stretched across parts of Europe.